Dear Friends of St Hilary's! It is with great pleasure that I welcome you all to our wonderful St Hilary's of Poitier Church. I have been most privileged to be invited by our bishop to become the vicar of St Hilary's. 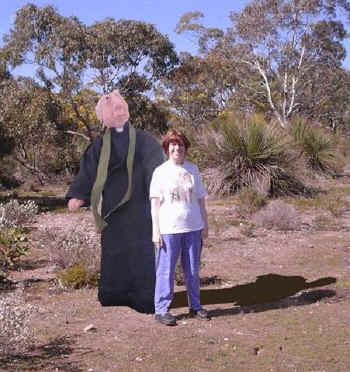 I am delighted to have been allowed to come here in my retirement having spent many years in the outback of Australia where I used to have charge of many small churches. Whilst I was in Australia I used to take one service a month at my different churches so I used to have to travel many many miles to do so. It is with great pleasure that I can now spend all of my time shepherding the flock of St Hilary's. The Sunday School children and congregation have made me most welcome. 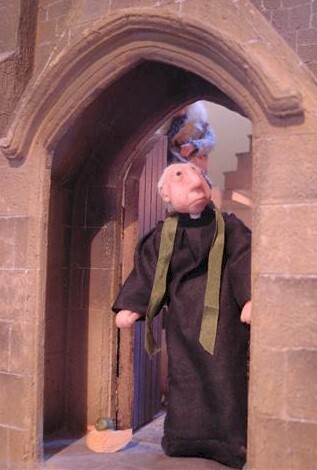 I am sure you will be all interested to know how I came to arrive in England and become vicar of St Hilary's. Well I was fortunate enough to meet Sarah whilst out in the Kaiser Stuhl Conservation Park which is in the Barossa Valley, South Australia.. You can see our chance meeting here! We both posed for Andrew to take our photograph! It was Andrew and Sarah who chatted to the bishop of St Hilary's and suggested that I may be interested in becoming the vicar. In retirement , before arriving in England, I always enjoyed a long morning stroll in the Kaiser Stuhl Conservation Park so it was no surprise for Sarah and Andrew to meet me there. The bird song is wonderful at that time and it is with joy that I would watch the kookaburras dancing and laughing in the trees. In deed I love to tell the St Hilary's Sunday School children all about my time in Australia and also about all the different birds that live there. Since arriving at St Hilary's I have been most happy and hope to remain there for many years to come. I do so hope that you enjoy your visit to St Hilary's! Vicar of St Hilary of Poitier's Church.